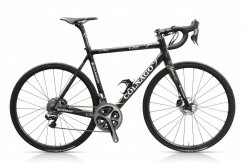 The Colnago C60 Disc is one of the most beautiful and highly sought after top tier road bicycles on the market today. Each frame is individually hand crafted in Colnago’s Italian Factory located in the outskirts of Milano. The C60 is also one of only a small handful of top tier carbon fiber road bikes to meet the rigorous ISO 9001 certification for quality manufacturing standards. The feel of the C60 will leave you speechless, the incredible power transfer and smooth ride will leave no doubt in your mind that the Colnago C60 is one of the best.